Ananda was Buddha’s cousin as well as one of his closest disciples. Though Buddha had different assistants, they were not always around. When Buddha was 55 years old he felt that he was getting older and needed an assistant to help him with his affairs. When the sangha gathered to discuss the matter many suggested themselves; only Ananda remained silent. Buddha made his choice of Ananda for his modesty, devotion and purity of intentions. Buddha and Ananda were of approximately the same age. 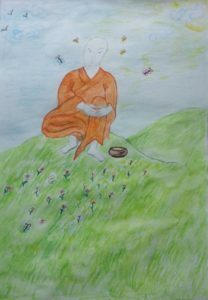 For the following 25 years, until Buddha’s death, Ananda followed Buddha everywhere, cleaned his abode, helped in everyday and sangha affairs, and tried to remember every word of his Teacher. In spite of direct and almost constant closeness to Buddha, and having attained the first level of realization (“entering the stream”), Ananda made little additional progress in his spiritual path. Buddha’s other disciples moved forward and attained enlightenment, but for Ananda this state was unachievable and this fact saddened him. From sutras we learn that Ananda’s doubts were dispelled when in Buddha Shakyamuni’s presence he had a vision of Sukhavati, Buddha Amitabha’s pure land. In Mahaparinibbana sutra there is an episode where Ananda, after learning Buddha’s intention to leave this world, is begging him to stay, but Buddha remains adamant. Buddha predicted that after his death Ananda will attain enlightenment and so it happened. Ananda became the second Buddhist patriarch, “the Knowledge keeper”, and most of “Pali Canon” and “Sutta Pitaka” were recorded from his words. It is owing to him that we can read Buddha’s words now. Among Buddha’s other disciples Ananda’s personality is notable for his imperfection. For a very long time he was unable to attain liberation. He also was troubled by the death of Sariputta, his close friend. After Buddha’s death he felt loneliness and isolation and doubted his own ability to attain liberation. This imperfection makes Ananda’s image so close and human to us, showing that the path to liberation from suffering is accessible to all who are sincere and devoted in their service. In this way imperfection itself becomes a ground for liberation. So it was in Buddha’s days and so it is in our days. Ananda was a devotee, a voluntary servant of Buddha, but at the same time he felt as if he were isolated from the world, even as if he were a failure. He had no personal life, he did not have even minimal freedom like freedoms of other monks who received initiation. All of his time and power he devoted to service to Buddha, often in very common everyday affairs, affairs which he did not demand high thoughts on Dharma and prolonged hours of meditation. Even though Ananda had an intellectual understanding that his situation was in fact a privilege and honor for him, he still felt himself like an outcast. He felt disgraced by his position as a servant. While others attained insights and realizations Ananda, though being so close to Buddha and remembering his every word, seemed to lose even the slightest hope for liberation. No wonder that sadness and depression settled in his heart. Already knowing about the approach of his own death Buddha reproaches Ananda with insensitivity: in “Mahaparinibbana sutra”. He says to Ananda that before it was time to ask Buddha to delay his departure, but at that moment it’s too late as for so long they were together. And when Buddha was drawing Ananda’s attention to beautiful places he was sort of saying: “Ananda, wake up, look at this place, where I am present. Your consciousness is present here as well. You are not to leave it.” In this way Buddha was indirectly pointing to Ananda’s heart. In numerous mirrors Buddha was showing Ananda the beauty of the nature of mind. We can see how difficult this path is, how hard it is to recognize that which is always present next to us. Here it is – the eternal presence of Buddha. It is here, there is nothing to cling to, nothing to attain; it is just to be recognized in all phenomena of the world. Buddha says: “Ananda, did I not tell you that everything is impermanent in this world?”. By this the Buddha points out that all phenomena are impermanent, changeable and subject to suffering. This realization brings Ananda to recognize the ever present place nature of mind. All that Ananda had to do was to let go of his idea of his personality and to see what is left over. “One new spring morning Buddha was traveling with Ananda through blooming meadows. Bees filled the air with even and broad buzzing sounds that streamed in all directions, yet Ananda felt sad in his heart. “The Awakened One never insists on pointing out beauty and spaciousness to other students so much. Am I the only one who is so indifferent to it all!” thought Ananda feeling more and more guilty. “Ananda, my friend, this burden of sorrow and doubt that you carry with you is nothing but Sukhavati, the Land of Pure Bliss,” the Bhagavan said to him unexpectedly. “How is it so, Sir? exclaimed Ananda. The buzzing streamed into Ananda’s ears and the aroma from the flowers became even more distinct. But he was still expecting something else. Soon they settled to rest in the shade of a mango tree. Ananda crossed his legs, relaxed his shoulders, and solar plexus. He felt his back straightening itself out and he began to reflect on his teacher’s words. The youth’s mind embraced the despondency and confusion that reigned in his heart. He perceived it as just one phenomena in the limitless space of this world. Transitioning to the second level of concentration, Ananda perceived the outlines of his despondency and confusion, their transitoriness and constructedness. When entering the realm of No-thing, he saw that, like the sound of beating wings or clothes tearing, the despondency and confusion were uncovering their empty nature before him. Ananda’s perception became lucid and free. He became aware of the unmanifested qualities in his mind which he amassed thanks to his association with Bhagavan Shakyamuni. Ananda’s eyes beheld the Land of Pure Bliss that lies to the west in the direction of the setting sun. It is a realm where the righteous abide after passing from this world with good karma. The harmonious colors and forms in Ananda’s vision seemed both familiar and transformed. All living things here breathed the happiness of liberation from unskillful qualities. They shared their joy with space itself and, supported by mental clarity, rested in equanimity. Birth and dissolution happened here in direct relation to the accumulation or lack of virtuous qualities. Beings emerged from lotuses or prayers uttered by the siddhas. Death in this world did not have a terrifying appearance. She appeared as a conductress and preceptress during the transition into other realms. In a beautiful palace, surrounded by blooming orchards, amidst gods, spirits, animals, plants and shining crystals there sat an Awakened One, a Buddha. Youthful in appearance, his body was glowing with the noble red radiance of a setting Sun. When Ananda saw him tears of happiness welled up in his eyes and he experienced the completeness of joyous peace.